The "65" sticker that Redbirds will have on their helmets on Saturday, January 10. It was the kind of moment that makes everyone forget about football. With just a minute left in Illinois State’s quarterfinal game against host Eastern Washington, a fan in the stands had a medical emergency. The game stopped, and medical staff rushed to help him. That man was John Rodgers, father of Eastern Washington offensive lineman Jake Rodgers. Suffering apparent heart problems, John was taken to the hospital. He died December 27. His death shook the Eastern Washington family—and it stayed with the Redbirds. On Saturday, when Illinois State faces North Dakota State in the FCS title game, every Redbird will have a “65” sticker on their helmet, in honor of John Rodgers. No. 65 is Jake’s number on the Eagles. 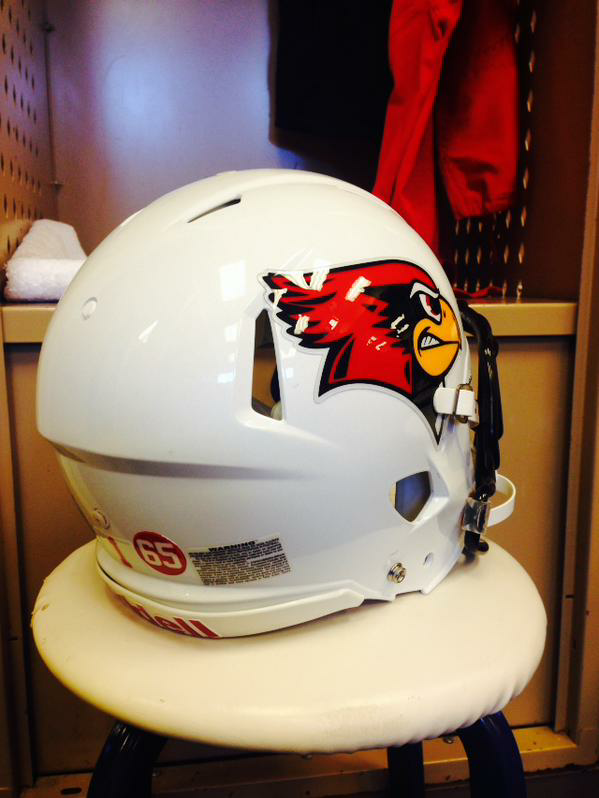 Another look at the “65” decal on the Redbird helmets. The decal idea came from coach Brock Spack and his players. They’ve spent the past two weeks battle-planning for the most important game of their lives, but still found time to think back to John and Jake. The Redbirds and Eagles know each other well. The Redbirds lost in the “Inferno” (Roos Field) in Cheney, Washington, in the 2012 FCS playoffs. The ’Birds got their revenge December 13, with that 59-46 victory. Spack said the December 13 episode shook up his players, some of whom called their dads right after the game from the locker room. It was a wake-up call, he said. While Chaves says he has great respect for North Dakota State’s championship-winning program, he knows it’s just human nature for some Eagles to be rooting for Illinois State on Saturday. “You hope you lost to the team that won it all,” he said. The ISU Football program and Coach Spack are not only incredible on the field, but are amazing men of character as well. EWU thanks you!!! What a very beautiful and touching gesture by the team. PROUD TO BE A REDBIRD!!! !